You have probably read a number of texts about customer experience, why it’s important and how you should improve it. Naturally, every business should want to improve this, especially since customers today are demanding and aware of options. Improving the experience isn’t rocket science and it per se will improve your brand image and eventually results. 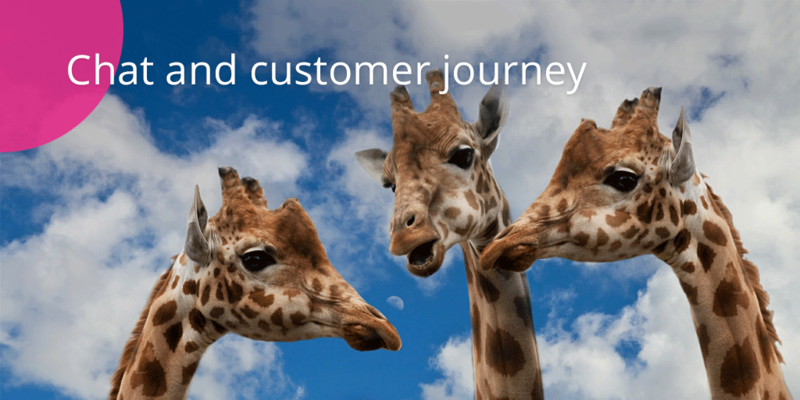 In our white paper we discussed the four stages of the customer journey, and how live chat can improve the experience at each stage: awareness, consideration, decision and delight. If we start by looking at the awareness stage, you might wonder how a live chat possibly could help someone who has only just realised they have a problem that needs solving? Let’s say an individual just decided that they need a new coat for autumn or a bigger car. It’s SEO, ads, online presence and content that brings these potential customers to your site over your competitors. But perhaps your existing happy customers have recommended you to their friends because of your amazing service. When this person visits your page you are given the chance to deliver your best customer service by providing real time support and additional information about products. Moving onwards to the consideration stage the chat already has a lot of possibility to impact. A first time visitor on your site is much more likely to interact if they are sent an automated greeting message or a targeted marketing action. Sometimes it’s enough for the customer to see that you're available, just like in real life situation. As an example, let’s say that you have an online shop, and someone enters your site for the first time. This person is unlikely to call you to ask for delivery times or when size 6 will be back in stock. However, if they are able to get an answer in real time without even leaving the web page, it will make all the difference. And let’s not forget that live chat is the biggest lead generator for many B2B companies (including giosg). The importance of being available to a potential customer when they are actively looking for a solution to their problem, in the right state of mind and interested in what you have to offer could not be highlighted enough. It’s all about timing. Live chat plays the biggest role in the decision stage. Let’s stick with our online shop example, and say that the customer is about to buy the coat, it's in their basket, but they are hesitating. Just like in a real life situation, sometimes all they might need is a small nudge before making the purchase, or maybe you could offer free shipping to guarantee the buy? Don't leave the faith of the purchase in the hands of someone else or wait around for your visitor to possibly contact you, be there and ensure the buy and a great experience. And finally, don’t we all want to delight our customers leaving them as satisfied promoters of our brand? In this stage, personalised communication plays a huge role. If your customer wants to give some feedback, whether they are satisfied with their new coat or not, what’s a more convenient way to do that than through live chat? Chat is also an easy way for customers to deal with issues such as missing a part from their newly delivered sofa, or asking for extra instructions. In fact, a Salesforce study shows that 34% of millennials would rather get their teeth cleaned at the dentist, than wait in line for customer service. We feel your pain, and therefore want to offer our customers and in addition their customers a more convenient solution that fits today’s hectic world. On average, a customer service agent can manage up to 5 chat conversations simultaneously, whereas they can only handle one phone call or email at a time. By focusing on chat conversations, your resources are channeled more effectively and you serve your customers in the best way possible.